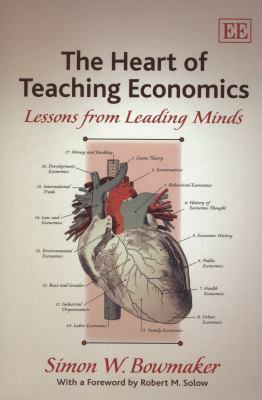 The Heart of Teaching Economics is a marvellously entertaining and lively book. All who read it cannot help but come away from the experience with a richly enhanced understanding of the power, virtue and importance of teaching. Wayne Geerling, The Business Economist These interviews will prove illuminating for anybody who teaches economics, novice or old hand alike. They show that it takes deep knowledge of the subject, empathy and hard work to be a good teacher and also that the greatest teachers bring tremendous energy and creativity to the task of inspiring students with that passion to understand and improve the world that defines economics at its best. An inspiring book for those of us who care about the next generation of economists. Diane Coyle, author of The Soulful Science: What Economists Really Do and Why It Matters Everyone remembers their favourite teacher. The testimonies recorded here provide a great insight into the minds of some of the most popular and successful to have graced a lecture hall. The range of styles is wide, but the theme of inspiration is common to all. This book will be of tremendous interest to any aspiring teacher. It will also appeal to anyone who wonders why their inspiration to understand economics still burns brightly so many years after their last lecture. Mervyn King, Governor of the Bank of England Are you a freshly minted economics PhD, dumped clueless in front of your first class? Or are you an experienced and good teacher, trying to raise your game to the next level? In either case, this book offers you a whole course of master classes. Simon Bowmaker deserves the economics profession s thanks for bringing together these gems of ideas and suggestions from our best practitioners of the art of teaching. Avinash Dixit, Princeton University, US This unique monograph comprises a collection of interviews conducted face-to-face with leading economists at universities throughout the United States. Presented with the singular opportunity to reflect on and share their wisdom and experience, the 21 interviewees discuss how they interpret, understand and practice their role as teachers. In addition to providing lessons that will inform the way others teach, the interviews shatter the illusion that teaching and research are strictly independent and competing activities. The Heart of Teaching Economics serves not only as a welcome resource for scholars and students of economics, but as a guidebook and inspiration for those who will help to shape the minds of future economists.